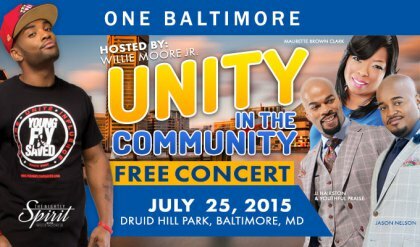 Radio One Baltimore Holds Unity Concert | Broadcast Public Service: Local Stations. Big Impact. Nearly 18,000 people gathered at Baltimore’s Druid Hill Park on July 25 to attend an eight-hour gospel concert put on by Radio One’s new Gospel station Praise 106.1 (W291BA/WLIF-HD2). Along with the music, by over a dozen artists, the event featured station personalities and local politicians, all pushing for peace in the streets of Baltimore. "I believe this event was a catalyst for change. When 18,000 people can gather peacefully for the purpose of prayer, praise, empowerment, and fun then I know Baltimore is on its way to healing," said Howard Mazer, Radio One Baltimore GM/VP.